Bananas are the ultimate good-intention food. I buy a nice organic bunch every single week with the intention of sticking one in the kids’ lunches, tossing others into some oatmeal, and eating one before bed. 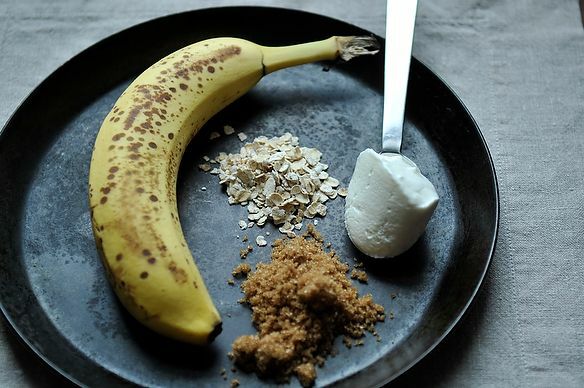 But in the real world, which I sadly inhabit all too often, half the packed-lunch bananas come home looking smashed and miserable, I forget to make oatmeal and for some weird reason a stiff drink and a cooking magazine seem to keep replacing a late-night bust out of potassium. Go figure. So I start each week with a nice pile of golden bananas, and a heart that wishes not to waste them. Enter Best Banana Pancakes. I can forgive you for wondering, um, isn’t this supposed to be a blog about weeknight cooking and if I were going to make this for breakfast isn’t it a lot more work than pouring a bowl of cereal and what’s gone wrong with Jenny? To the first point I say, breakfast for dinner now and then is a good thing. As for the latter, yeah we’re asking you to pull out your sifter but really the batter doesn’t take terribly long to whip up, and you have to let it sit for ten minutes anyway, which is plenty of time to make lunches, look over homework and yell at random children about the outrageously uncombed state of their hair and make pointless connections like if they can’t be responsible for solo grooming maybe they don’t need an Ipod. So, I make a LOT of banana pancakes, and energy is no liar, these are the best. Maybe it is the interesting technique (I loved watching everything soak and foam like a science project, and mixing bananas with baking soda is a new one for me) or maybe it is just the way the other high-virtue-good-intention ingredients like yogurt and oats come together in the pan. The only adjustment I made was to use a ¼ cup rather than a ½ cup as a ladle because I wanted smaller cakes and was using a fairly petite non-stick pan, which required no oil. Moral of the story: save those bananas, friends. This one’s a winner. 1. Beat egg and mix together with yoghurt, oats, sugar and milk. 2. Sift flour, baking powder and salt into a large bowl. 3. Lightly stir the wet ingredients into the dry until just combined and still lumpy. Add additional milk if too thick. Stand 10 minutes. 4. Mash the banana well with the baking soda and stir gently into the batter along with the melted butter. 5. Heat a large skillet, lightly greased with oil, melted butter or cooking spray, over medium heat until a drop of water sizzles and dances (if it evaporates immediately lower the temperature). Add a half cup of batter and cook until bubbles appear on surface and edges firm. Turn over with spatula and cook on the other side until golden brown. Repeat, regreasing pan as needed. 6. Serve immediately (or if needed you can keep warm, covered, in 200F oven) with melted or whipped butter and warmed maple syrup. By day, Jennifer Steinhauer, aka Jenny, is the Los Angeles Bureau Chief for The New York Times. By night, she is an obsessive cook. Glad people are enjoying the pancakes!! I made these tonight--they were really good. Also made your flourless chocolate cake yesterday (but had a terrible time taking it out of the springform pan--I should have left it on the plate part!). We LOVE breakfast for dinner! I have everything to make these. I can't wait! the recipe sounds great; i can't wait to try it. i do have a comment, tho, about the way the recipe, and others i encounter, is written. why don't people write recipes, listing the ingredients in the order in which they're incorporated? i find it unnecessarily difficult to read the text of a recipe and have to hop all over the ingredient list to find the one that's now being added to the bowl. is there a reason for writing this way? am i missing something? I happen to have just the right banana...can't wait til dinner!